Only a year has gone by and so much has happened in downtown Miami. The gantry cranes dotting the skyline like an erector set are now gone. At the time, driving over the MacArthur Causeway from Miami Beach, I wondered how the real estate market was going to absorb the excess inventory that was growing like wildflowers. The new place to be seen in Miami is right downtown. At your fingertips are all the cultural necessities a Renaissance man could ever need. Just over the causeway from Miami Beach is the American Airlines Arena, the Performing Arts Center, and the soon to be new Miami Art Museum. 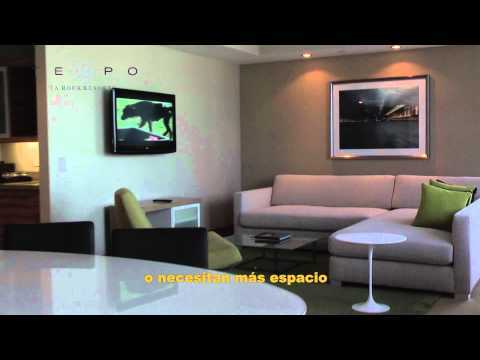 At the center of it all is Tempo Miami, A RockResort signature property in Biscayne Bay. There’s no question now that the real estate developers got this one right. It’s all about location, location, location and the Tempo Miami has it, hands down. The luxury hotel is appointed with 56 guestrooms and suites. Each room has an oversized, spacious balcony complete with chaise lounges, opaque privacy glass, and views of Biscayne Bay. The sophisticated design of the rooms make you feel as if you’ve just closed and moved in to your new Miami digs. This is not your average hotel room! The RockResort designers outdid themselves here. The chic bathroom, complete with marble flooring, rain shower, soaking tub and in-mirror flat screen TV puts any Waterworks bathroom design to shame. The king size bed was adorned with 800-thread-count linens and there was enough closet space for any clotheshorse. Executive Chef Danny Wells had an interesting story to tell. He used to serve the Admiral’s staff on a U.S. aircraft carrier and honed his culinary craft in Italy entertaining military brass, dignitaries and diplomats. We had the opportunity to sample some of the best amenities Tempo had to offer. A RockResorts Spa eighty minute Swedish massage for $160 (including gratuity) was everything I expected. The massage room was super relaxing and beautifully appointed. The rooftop pool gives the impression that you’re in a private gated community. The pool, located on the fourteenth floor, is surrounded by three-story luxury town home-style apartments in the sky. These units should be available in time for the next Super Bowl game. Be prepared to bring a few of your friends along and live large! We used the hotel’s complimentary Cadillac Escalade to explore Key Biscayne. Moses and Fritz, part of the concierge team, are a delight to be chauffeured by and will accommodate your every wish. Just ask.